In real life, when bored, distracted, or annoyed, I will wish upon a star for zombies. This started soon after playing Resident Evil 2 in 1998, which began my love affair with zombies. I would sit in class, or at work, and ponder what I would do if a zombie outbreak were to occur at that very moment (NOTE: I would be awesome, no matter what the scenario, as it was MY imagination. Put in the more serious context of a “realistic” hypothetical zombie outbreak scenario, I’d probably still do fairly awesome barring any encounters with fellow human survivors who are actually well versed with weaponry). Point being, that sometimes, fiction has bored me and made me insert zombies on my own. P.S. I Love You? So much better when you imagine Hillary Swank and the entire cast being consumed by the undead. The Baz Lurman Australian epic, Australia? Well, no, not even zombies would make that film watchable. But you get the point. Zombies can also ENHANCE something that’s already awesome. Like westerns. 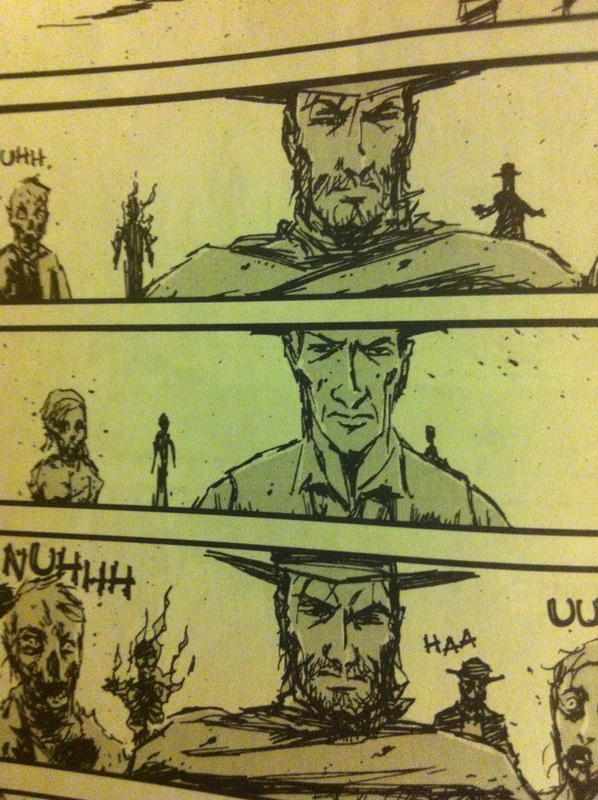 Imagine Eastwood’s Man With No Name against a horde of the undead. 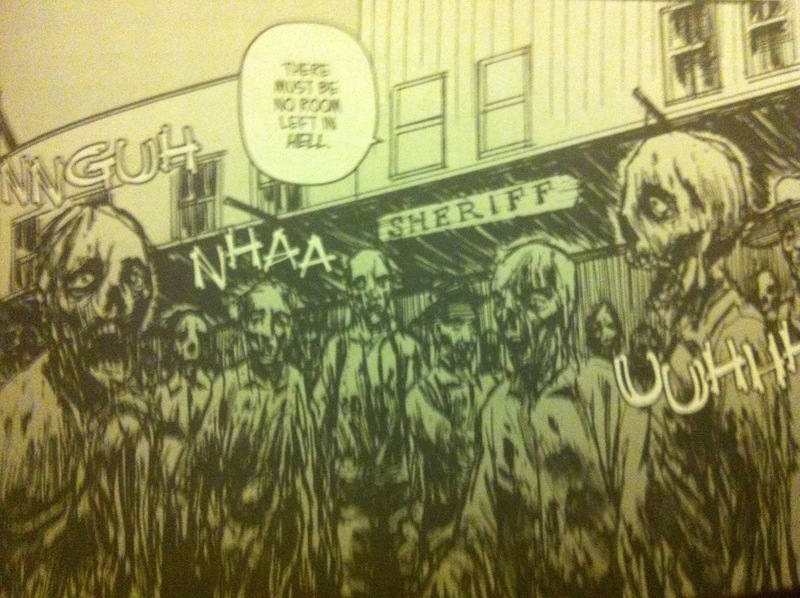 “No more room in hell” is the best description for zombies ever. Simple and to the point. First utilized in Dawn of the Dead (1978). Oh, wait. You don’t have to. Someone already did that for you (and several years before the video game Red Dead Redemption: Undead Nightmare, which is fairly awesome itself). Written by Rick Spears. 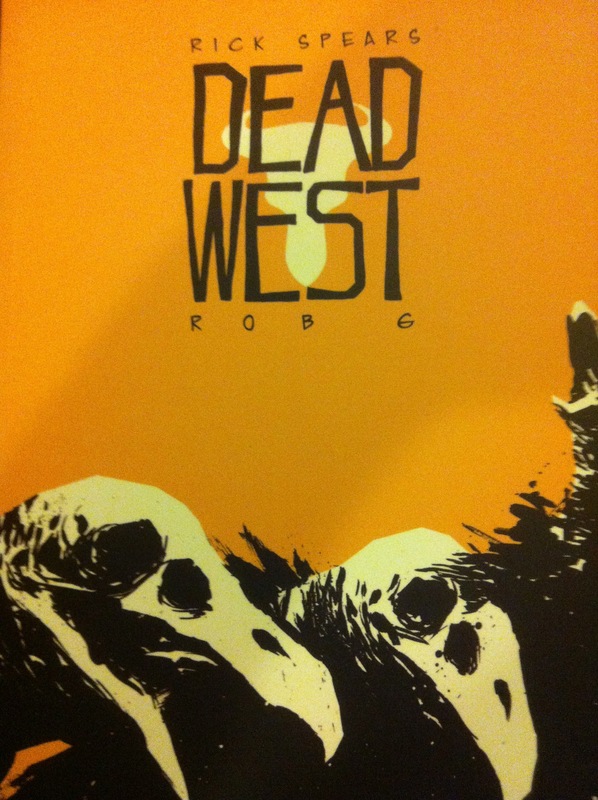 Art by Rob G. I present to you, Dead West. White people kill a Native American tribe, the last survivor of the tribe puts a curse on the town that raises the dead. Into this mess come stand ins for Eastwood’s Man With No Name as well as Eli Wallach’s Tuco from The Good, The Bad, and The Ugly. Cowboy and zombie shenanigans ensue. 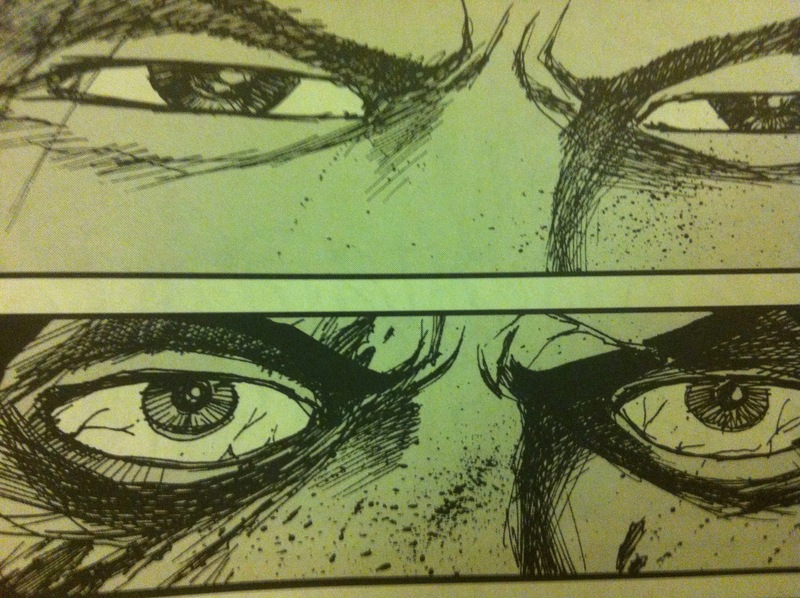 This is a quick, done in one graphic novel. A lot of stock western characters and tropes are burnt through quickly, but in a fun way, not in a “check this off of a western genre list” way. There’s lawmen, prostitutes, bar keeps, more prostitutes (but with hearts of gold!) and spirit animals for good measure, too. Cowboy/Zombie Native American showdown. It’s all the eyes. The rotting, undead eyes. Rob G’s art is fantastic. It’s got a rough, scratchy feel. Not that it feels unfinished, there’s a definite commitment to each line, but it’s rough in a…well…manly sense that’s befitting a western AND a horror book. 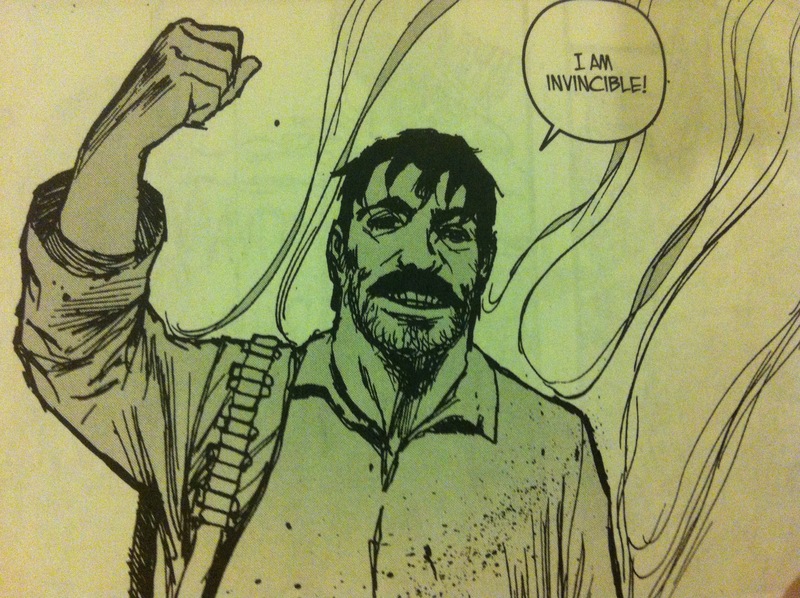 He also draws some HILARIOUS death scenes. That’s something people forget about the slow, shambling zombie, that he can be much funnier than his running rabid, not really a zombie counterpart. Slow zombies can creep up on folks for hilarious “what’s that behind me” deaths, and Rob G, nay, MR. G, draws these very well. Rick Spears has a great handle on the characters. Not that they’re all well defined, as I’ve said, they’re mostly types. But he defines them just enough for you to understand their role in the story, while still caring just enough whether or not they live or die. That’s what I want to do to your face. Go watch Blazing Saddles. Or at least YouTube the ending. It’s not required viewing for this comic, but it’s required viewing for life. But in the context of this post, it’s about characters from one genre playing it straight upon sidestepping into another genre. There’s no pause to take stock of the surroundings, it’s just cowboy business as usual. If any of my horror recommendations, especially horror western recommendations like The Sixth Gun or American Vampire, have tickled your fancy, this would be right up your alley. It’s a wonderful mashup of two great genres, its action packed, a little scary, and a lot funny. You sadly cannot purchase this digitally, but you can get it on Amazon for a pretty reasonable price, and might be able to find it at your local comic shop too.